Founded in 2007, the Boulder Kung Fu Academy offers instruction in traditional Chinese martial and healing arts. 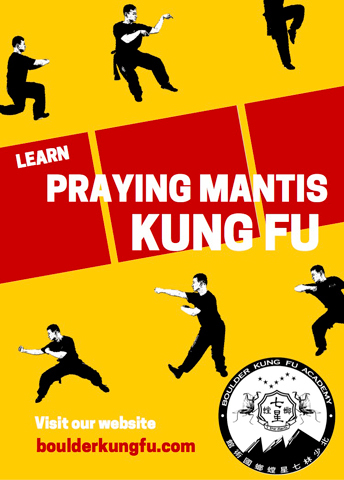 We specialize in Northern Shaolin Seven-Star Praying Mantis Kung Fu. We also offer instruction in Wu Style Tai Chi Chuan and Qigong. Registration is ongoing so students can join at any time. Please click here if you would like to schedule a time to observe a Kung Fu class (or here if you would like to attend a $10 trial Tai Chi class). Observing a kung fu class (or participating in a trial Tai Chi class) is the best way for prospective students to determine if BKFA is a good fit for them. A simple application process helps ensure a prospective student is a good fit for BKFA. Please note we do not currently offer classes for children. Mature teens may be considered with parental consent. Stay informed about new offerings, special workshops and events?